Spitfire List | Who is Michael [AKA “Mykhailo”] Bociurkiw? Who is Michael [AKA “Mykhailo”] Bociurkiw? Posted by Dave Emory ⋅ July 23, 2014Post a comment Email This Post Print This Post Tweet This! COMMENT: In the wake of the rhetorical/political firestorm over the downing of Malaysian Airlines Flight MH17, we note that the OSCE (Organization for Security and Cooperation in Europe) is front and center in the “investigation” into the event. We put the quotation marks around investigation because the OSCE’s Special Monitoring Mission is headed by one Michael [“Mykhailo”] Bociurkiw. A Canadian citizen of Ukrainian extraction, he was an assistant editor for the Ukrainian Weekly. Issues of the periodical available online point to a “pro-OUN/B” bias. A 1987 letter from the World Jewish Congress’ general counsel notes an apparent anti-OSI bias on the part of articles written by Bociurkiw. Note that the Office of Special Investigations was the Justice Department unit charged with investigating Nazi war criminals living the U.S. 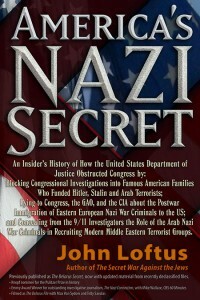 The unit was formerly headed by John Loftus, who resigned his position as head of OSI as the Reagan administration was taking office because many of the people he was investiagating held staff positions with Reagan. We request the help of listeners in locating issues of the Ukrainian Weekly referred to in the Rosenbaum letter. Bociurkiw’s position with the OSCE apparently places yet another OUN/B advocate in the mix, charged with “investigating” actions taken by a government inextricably linked with OUN/B heirs such as Swoboda, Pravy Sektor and the Ukrainian National Congress. ‘‘OSCE Describes Process for Identifying Bodies from MH17 Attack” by Simon Santow; ABC News; 7/21/2014. The OSCE has told AM it has finally obtained better access on the ground near the site where MH17 was shot down in eastern Ukraine. The spokesman for the Special Monitoring Mission to Ukraine, Michael Bociurkiw, says they have seen some remains and bodies stored in refrigerated rail wagons in the town of Tores. He says after the earlier chaos, there’s now greater co-operation but there are still plenty of concerns about getting access for crash investigators and of securing the perimeter of the area 24 hours a day. Enclosed, in accordance with your request of this date, is a nearly complete run of The Ukrainian Weekly (Jersey City, N.J.) from Vol. LIII, No. 40 (October 6, 1985) through Vol. LV, No. 4 (January 25, 1987). These 61 issues come from my personal library, and I appreciate your assurance that they will be returned to me by courier at your earliest opportunity. As I indicated on the phone, Michael Bociurkiw is a frequent contributor to the newspaper. Indeed, one of his articles appears on the front page of the oldest of the enclosed issues (October 6, 1985), under the byline “Mykhailo” Bociurkiw. Vol. LIII, issue no. 50 (December 15, 1985) reports that he has been named Assistant Editor of the newspaper. As you can see, I have made a practice of noting on the front page of each issue those pages which contain articles of interest (which, of course, would include all articles, editorials, opinion pieces, advertisements, etc. regarding Nazi crimes and their perpetrators). Where more than one article of interest appears on a particular page, I generally have noted this fact through the use of parentheticals. I am convinced, by the way, that many of the unbylined “Nazi stories” were penned by Mr. Bociurkiw. In any event, the anti-OSI, anti-Nazi prosecution bias in Bociurkiw’s written output and in the newspaper generally will be readily apparent as you read through the enclosed issues. . . . Thanks for the heads up. I did some key word searches on the Internet, but admit to being a little shy to visit their website directly, knowing their heritage. They definitely appear to be “as advertised”! Independent monitors helping Canberra negotiate with armed rebels over access to the MH17 crash site say Australians are already on the ground ‘sussing the security situation’. Foreign Minister Julie Bishop hopes the fact the Netherlands is now officially in charge of the investigation will allow the site near the Russian border to be secured within days. Australian officials are relying on the Organisation for Security and Co-operation in Europe’s (OSCE) monitoring mission in Ukraine to act as an intermediary with rebels, who control the region where Malaysia Airlines flight MH17 was downed a week ago. OSCE spokesman Michael Bociurkiw has confirmed two Australian diplomats and one forensic expert visited the site on Thursday with his team. It’s believed the forensic expert was from the Australian Federal Police. Bociurkiw said the team, which included 12 OSCE monitors, also found more human remains on Thursday and another large piece of the fuselage. Parts of the wreckage that the team inspected on Wednesday had ‘almost machine-gun types of holes’, he said. Malaysia Airlines flight MH17 was shot down with 298 people, including Australians, on board a week ago over rebel-held territory in eastern Ukraine in as yet unexplained circumstances. Dutch authorities say they can only be sure that 200 corpses have been recovered and no recovery efforts appear to be underway for more bodies or remains. Some 50 federal police officers are in London awaiting approval for an international team to work at the crash site under the aegis of the UN. Dutch Foreign Minister Frans Timmermans signed a memorandum of understanding with his Ukrainian counterpart Pavlo Klimkin on Thursday which officially put the Netherlands in charge of the investigation. Ms Bishop thinks that’s the key to getting Russian-backed rebels to allow the international community in. ‘I am very optimistic after today’s meetings that we will have in place the legal and operational framework that will enable our mission to be carried out as soon as possible,’ she told reporters in Kiev. Thursday’s MH17 negotiations were conducted on a day of political upheaval in Ukraine. Prime Minister Arseniy Yatsenyuk resigned in a shock move after the collapse of the ruling parliamentary coalition paved the way for new legislative elections. The Ukrainian president Petro Poroshenko signed a ‘memorandum of understanding’ which will push for international police to secure the site. He said earlier that the signing was a ‘humanitatian gesture’ and would help find those responsible for the disaster. Australian Prime Minister Tony Abbott’s plan to deploy armed police officers to the site of the Malaysian Air crash risks increasing tension in the Ukrainian territory held by Russian-backed rebels, according to political analysts based in Berlin and Brussels. Abbott said yesterday he was dispatching 100 Australian Federal Police, some of them armed, and members of Australia’s military, to help recover bodies and evidence from Flight MH17 which crashed on July 17 near Donetsk in the east of the country killing 298 passengers and crew. Abbott said Australia wants to bring home its dead. The Netherlands is sending a separate mission of 40 unarmed military police to the site to help complete the forensic work and gather evidence, Rutte said this week. The U.K. has sent one forensics specialist to Kiev and nine British scientists are working in the Netherlands to help identify bodies and secure evidence. The U.K. is ready to offer logistical support and is keeping in close contact with the Australians and Dutch over how it can assist, though it won’t be sending police or technicians to Ukraine, the Foreign Office said. The Netherlands, Australia and Ukraine are considering proposing a United Nations resolution for an armed mission to secure the crash site, Dutch news agency ANP reported yesterday, citing diplomatic officials familiar with the matter that it didn’t identify. Australia, a Security Council member, will submit the resolution if officials at the site can’t perform duties in the next few days, it reported. Australia earlier dispatched 90 police to help with the crash probe. The reinforcements will first fly to the Netherlands. There were 194 Dutch nationals and 27 Australians on MH17. Ukrainian President Petro Poroshenko this week signed an accord under which the Netherlands will lead the international probe into the crash. The Foreign Ministry in Kiev said a separate agreement was signed yesterday for an “Australian mission of civil police” to help protect the mission. There was no mention from either Poroshenko or the Foreign Ministry on whether the Australians would be armed. Dmitry Gau, the spokesman for rebels, wouldn’t immediately comment on the Australian plans to carry firearms, when contacted by Bloomberg News. Fredrik Erixon, director of the European Centre for International Political Economy in Brussels, warned against sending armed teams into eastern Ukraine to search for victims. As hinted at the end, it’s possible there’s already a backroom deal in place with the the rebels to ensure that the situation doesn’t get even more out of control. But if that isn’t the case, then we’re looking at a situation where an international force that the rebels will surely view as being on the side of the Kiev government is now operating in the middle of an area so dangerous that a civilan airliner was just shot down. Could this be the start of an easing of tension? Probably not, but let’s hope so.